Presidents Theodore Roosevelt, 1901-09 (left), William Howard Taft, 1909-13 (center), and Woodrow Wilson, 1913-21 (right) are often referred to as the "Progressive Presidents"; their administrations saw intense social and political change in American society. The Progressive Era was a period of widespread social activism and political reform across the United States, from the 1890s to 1920s . The main objective of the Progressive movement was eliminating corruption in government. The movement primarily targeted political machines and their bosses. By taking down these corrupt representatives in office a further means of direct democracy would be established. They also sought regulation of monopolies (Trust Busting) and corporations through antitrust laws. These antitrust laws were seen as a way to promote equal competition for the advantage of legitimate competitors. Many progressives supported Prohibition in the United States in order to destroy the political power of local bosses based in saloons. At the same time, women's suffrage was promoted to bring a "purer" female vote into the arena. A second theme was building an Efficiency Movement in every sector that could identify old ways that needed modernizing, and bring to bear scientific, medical and engineering solutions; a key part of the efficiency movement was scientific management, or "Taylorism". Many activists joined efforts to reform local government, public education, medicine, finance, insurance, industry, railroads, churches, and many other areas. Progressives transformed, professionalized and made "scientific" the social sciences, especially history, economics, and political science. In academic fields the day of the amateur author gave way to the research professor who published in the new scholarly journals and presses. The national political leaders included Theodore Roosevelt, Robert M. La Follette, Sr., and Charles Evans Hughes on the Republican side, and William Jennings Bryan, Woodrow Wilson and Al Smith on the Democratic side. Initially the movement operated chiefly at local levels; later, it expanded to state and national levels. Progressives drew support from the middle class, and supporters included many lawyers, teachers, physicians, ministers and business people. The Progressives strongly supported scientific methods as applied to economics, government, industry, finance, medicine, schooling, theology, education, and even the family. They closely followed advances underway at the time in Western Europe and adopted numerous policies, such as a major transformation of the banking system by creating the Federal Reserve System in 1913. Reformers felt that old-fashioned ways meant waste and inefficiency, and eagerly sought out the "one best system". Disturbed by the waste, inefficiency, stubbornness, corruption and injustices of the Gilded Age, the Progressives were committed to changing and reforming every aspect of the state, society and economy. Significant changes enacted at the national levels included the imposition of an income tax with the Sixteenth Amendment, direct election of Senators with the Seventeenth Amendment, Prohibition with the Eighteenth Amendment, and women's suffrage through the Nineteenth Amendment to the U.S. Constitution. Brand Whitlock were active at the state and local level, while Lincoln Steffens exposed political corruption in many large cities; Ida Tarbell went after John D. Rockefeller's Standard Oil Company. Samuel Hopkins Adams in 1905 showed the fraud involved in many patent medicines, Upton Sinclair's 1906 novel The Jungle gave a horrid portrayal of how meat was packed, and, also in 1906, David Graham Phillips unleashed a blistering indictment of the U.S. Senate. Roosevelt gave these journalists their nickname when he complained they were not being helpful by raking up all the muck. The Progressives were avid modernizers. They believed in science, technology, expertise—and especially education—as the grand solution to society's weaknesses. 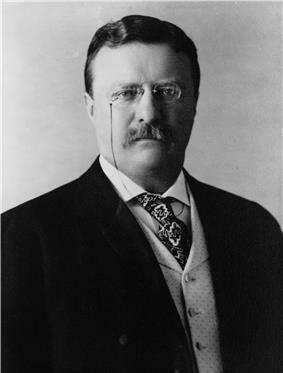 Characteristics of Progressivism included a favorable attitude toward urban-industrial society, belief in mankind's ability to improve the environment and conditions of life, belief in an obligation to intervene in economic and social affairs, and a belief in the ability of experts and in the efficiency of government intervention. Across the nation, middle-class women organized on behalf of social reforms during the Progressive Era. They were especially concerned with Prohibition, suffrage, school issues, and public health. built on Progressive-era strategies of municipal housekeeping. During the Progressive era, female activists used traditional constructions of womanhood, which imagined all women as mothers and homemakers, to justify their entrance into community affairs: as "municipal housekeepers," they would clean up politics, cities, and see after the health and wellbeing of their neighbors. Donning the mantle of motherhood, female activists methodically investigated their community's needs and used their "maternal" expertise to lobby, create, and secure a place for themselves in an emerging state welfare bureaucracy, best illustrated perhaps by clubwoman Julia Lathrop's leadership in the Children's Bureau. As part of this tradition of maternal activism, the Progressive-era General Federation supported a range of causes from the pure food and drug administration to public health care for mothers and children to a ban on child labor, each of which looked to the state to help implement their vision of social justice. The Carrie Chapman Catt was the key leader in the early 20th century. Like AWSA and NWSA before it, the NAWSA pushed for a constitutional amendment guaranteeing women's voting rights, and was instrumental in winning the ratification of the Nineteenth Amendment to the United States Constitution in 1920. A breakaway group, the National Woman's Party tightly controlled by Alice Paul, copied the militant suffragettes in Britain who used violence to gain publicity and force passage of suffrage. Paul's members chained themselves to the White House fence in order to get arrested, then went on hunger strikes to gain publicity. While the British suffragettes stopped their protests in 1914 and supported the British war effort, Paul began her campaign in 1917 and was widely criticized for ignoring the war and attracting radical anti-war elements. The number of rich families climbed exponentially, from 100 or so millionaires in the 1870s, to 4000 in 1892 and 16,000 in 1916. Many paid heed to Andrew Carnegie's Gospel of Wealth that said they owed a duty to society that called for philanthropic giving to colleges, hospitals, medical research, libraries, museums, religion and social betterment. Mowry, George E. Theodore Roosevelt and the Progressive Movement. (1946). Solty, Ingar. "Social Imperialism as Trasformismo: A Political Economy Case Study on the Progressive Era, the Federal Reserve Act, and the U.S.'s Entry into World War One, 1890-1917", in M. Lakitsch, Ed., Bellicose Entanglements 1914: The Great War as a Global War (LIT, 2015), pp 91-121. ^ Eleanor Flexner, Century of Struggle (1959), pp. 208-217. There is general agreement that that the Era was over by 1932, especially since a majority of the remaining Progressives opposed the New Deal. The politics of the 1920s was unfriendly toward the labor unions and liberal crusaders against business, so many if not most historians who emphasize those themes write off the decade. Urban cosmopolitan scholars recoiled at the moralism of prohibition and the intolerance of the nativists of the KKK, and denounced the era. Gerster and Cords argue that, "Since progressivism was a 'spirit' or an 'enthusiasm' rather than an easily definable force with common goals, it seems more accurate to argue that it produced a climate for reform which lasted well into the 1920s, if not beyond." Even the Klan has been seen in a new light, as social historians now see Klansmen as "ordinary white Protestants" primarily interested in purification of the system, which had long been a core Progressive goal. Much less settled is the question of when the era ended. Some historians who emphasize civil liberties decry their suppression during World War I and do not consider the war as rooted in Progressive policy. A strong anti-war movement headed by noted Progressives including Jane Addams (a future winner of the Nobel Peace Prize and perhaps the Era's most prominent reformer) was suppressed after Wilson's 1916 re-election, a victory largely enabled by his campaign slogan, "He kept us out of the war." The slogan was no longer accurate by April 6 of the following year, when Wilson surprised much of the Progressive base that twice elected him and asked a joint session of Congress to declare war on Germany. The Senate voted 82–6 in favor; the House agreed, 373–50. Some historians see the so-called "war to end all wars" as a globalized expression of the American Progressive movement, with Wilson's support for a League of Nations as its climax. The level of immigration grew steadily after 1896, with most new arrivals unskilled workers from eastern and southern Europe, who found jobs working in the steel mills, slaughterhouses, and construction crews in the mill towns and industrial cities. The start of World War I in 1914 suddenly stopped most international movement, which only resumed after 1919. Starting in the 1880s, the labor unions aggressively promoted restrictions on immigration, especially restrictions on Chinese and other Asians. The basic fear was that large numbers of unskilled, low-paid workers would defeat the union's efforts to raise wages through collective bargaining. Other groups, such as the prohibitionists, opposed immigration because it was the base of strength of the saloon power, and the West generally. Rural Protestants distrusted the urban Catholics and Jews who comprised most of the immigrants after 1890. On the other hand, the rapid growth of the industry called for large numbers of new workers, so large corporations generally opposed immigration restriction. By the early 1920s a consensus had been reached that the total influx of immigration had to be restricted, and a series of laws in the 1920s accomplished that purpose. A handful of eugenics advocates were also involved in immigration restriction. Immigration restriction continued to be a national policy until after World War II. Labor unions, especially the American Federation of Labor (AFL) grew rapidly in the early 20th century, and had a Progressive agenda as well. After experimenting in the early 20th century with cooperation with business in the National Civic Federation, it turned after 1906 to a working political alliance with the Democratic party. The alliance was especially important in the larger industrial cities. The unions wanted restrictions on judges who intervened in labor disputes, usually on the side of the employer. They finally achieved that goal with the Norris–La Guardia Act of 1932. When Democrat Woodrow Wilson was elected President with a Democratic Congress in 1912 he implemented a series of Progressive policies in economics. In 1913, the Sixteenth Amendment was ratified, and a small income tax was imposed on high incomes. The Democrats lowered tariffs with the Underwood Tariff in 1913, though its effects were overwhelmed by the changes in trade caused by the World War that broke out in 1914. Wilson proved especially effective in mobilizing public opinion behind tariff changes by denouncing corporate lobbyists, addressing Congress in person in highly dramatic fashion, and staging an elaborate ceremony when he signed the bill into law. 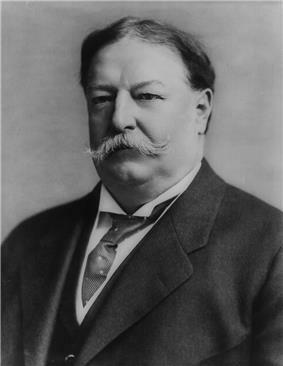 Wilson helped end the long battles over the trusts with the Clayton Antitrust Act of 1914. He managed to convince lawmakers on the issues of money and banking by the creation in 1913 of the Federal Reserve System, a complex business-government partnership that to this day dominates the financial world. By the start of the 20th century, a middle class had developed that was leery of both the business elite and the radical political movements of farmers and laborers in the Midwest and West. The Progressives argued the need for government regulation of business practices to ensure competition and free enterprise. Congress enacted a law regulating railroads in 1887 (the Interstate Commerce Act), and one preventing large firms from controlling a single industry in 1890 (the Sherman Antitrust Act). These laws were not rigorously enforced, however, until the years between 1900 and 1920, when Republican President Theodore Roosevelt (1901–1909), Democratic President Woodrow Wilson (1913–1921), and others sympathetic to the views of the Progressives came to power. Many of today's U.S. regulatory agencies were created during these years, including the Interstate Commerce Commission and the Federal Trade Commission. Muckrakers were journalists who encouraged readers to demand more regulation of business. Upton Sinclair's The Jungle (1906) was influential and persuaded America about the supposed horrors of the Chicago Union Stock Yards a giant complex of meat processing that developed in the 1870s. The federal government responded to Sinclair's book and The Neill-Reynolds Report with the new regulatory Food and Drug Administration. Ida M. Tarbell wrote a series of articles against Standard Oil, which was perceived to be a monopoly. This affected both the government and the public reformers. Attacks by Tarbell and others helped pave the way for public acceptance of the breakup of the company by the Supreme Court in 1911. 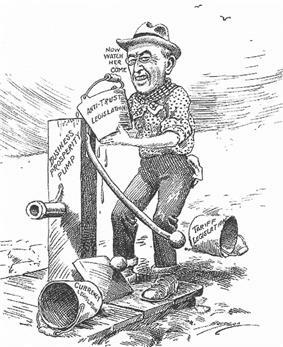 President Wilson uses tariff, currency, and anti-trust laws to prime the pump and get the economy working. The "Flexner Report" of 1910, sponsored by the Carnegie Foundation, professionalized American medicine by discarding the scores of local small medical schools and focusing national funds, resources, and prestige on larger, professionalized medical schools associated with universities. Prominent leaders included the Mayo Brothers whose Mayo Clinic in Rochester, Minnesota, became world famous for innovative surgery. The Progressives worked hard to reform and modernize the schools at the local level. The era was notable for a dramatic expansion in the number of schools and students served, especially in the fast-growing metropolitan cities. After 1910 the smaller cities began building high schools. By 1940, 50% of young adults had earned a high school diploma. The result was the rapid growth of the educated middle class, who typically were the grass roots supporters of Progressive measures. During the Progressive Era, many states began passing compulsory schooling laws. An emphasis on hygiene and health was made in education, with physical and health education becoming more important and widespread. The third wave of prohibition legislation, of which national prohibition was the grand climax, began in 1907, when Georgia passed a statewide prohibition law. By 1917, two thirds of the states had some form of prohibition laws and roughly three quarters of the population lived in dry areas. In 1913, the Anti-Saloon League first publicly appealed for a prohibition amendment. They preferred a constitutional amendment over a federal statute because although harder to achieve, they felt it would be harder to change. In 1913, Congress passed the Webb-Kenyon Act, which forbade the transport of liquor into dry states. As the United States entered World War I, the Conscription Act banned the sale of liquor near military bases. In August 1917, the Lever Food and Fuel Control Act banned production of distilled spirits for the duration of the war. The War Prohibition Act, November, 1918, forbade the manufacture and sale of intoxicating beverages (more than 2.75% alcohol content) until the end of demobilization. Agitation for prohibition began during the Second Great Awakening in the 1840s when Crusades against drinking originated from evangelical Protestants. Evangelicals precipitated the second wave of prohibition legislation during the 1880s, which had as its aim local and state prohibition. During the 1880s, referendums were held at the state level to enact prohibition amendments. Two important groups were formed during this period. The Woman's Christian Temperance Union (WCTU) was formed in 1874. The Anti-Saloon League was formed in 1893, uniting activists from different religious groups. Prohibition was the outlawing of the manufacture, sale and transport of alcohol. Drinking itself was never prohibited. Throughout the Progressive Era, it remained one of the prominent causes associated with Progressivism at the local, state and national level, though support across the full breadth of Progressives was mixed. It pitted the minority urban Catholic population against the larger rural Protestant element, and Progressivism's rise in the rural communities was aided in part by the general increase in public consciousness of social issues of the temperance movement, which achieved national success with the passage of the 18th Amendment by Congress in late 1917, and the ratification by three-fourths of the states in 1919. Prohibition was essentially a religious movement backed by the Methodists, Baptists, Congregationalists, Scandinavian Lutherans and other evangelical churches. Activists were mobilized by the highly effective Anti-Saloon League. Timberlake (1963) argues the dries sought to break the liquor trust, weaken the saloon base of big-city machines, enhance industrial efficiency, and reduce the level of wife beating, child abuse, and poverty caused by alcoholism. The Progressives tried to permanently fix their reforms into law through constitutional amendments 16–19. The 16th amendment made an income tax legal (this required an amendment due to Article One, Section 9 of the Constitution, which required that direct taxes be laid on the States in proportion to their population as determined by the decennial census). The Progressives also made strides in attempts to reduce political corruption through the 17th amendment and the direct election of U.S. Senators. The most radical and controversial amendment came during the anti-German craze of World War I that helped the Progressives push through their plan for prohibition through the 18th amendment (once the Progressives fell out of power the 21st amendment repealed the 18th in 1933). 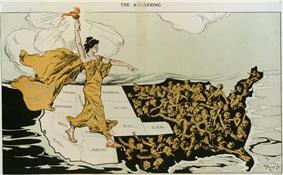 The final progressive amendment came with the passage of the 19th amendment and women's suffrage. Some Progressives, especially among economists, sponsored eugenics as a collectivist solution to excessively large or underperforming families, hoping that birth control would enable parents to focus their resources on fewer, better children. However, there were no major national, state or local programs that practiced or endorsed eugenics. Progressive leaders like Herbert Croly and Walter Lippmann indicated their classically liberal concern over the danger posed to the individual by collectivism and statism. The Catholics, although favoring collectivism, strongly opposed birth control proposals such as eugenics . Progressives believed that the family was the foundation stone of American society, and the government, especially municipal government, must work to enhance the family. Local public assistance programs were reformed to try and keep families together. Inspired by crusading Judge Ben Lindsey of Denver, cities established juvenile courts to deal with disruptive teenagers without sending them to adult prisons. 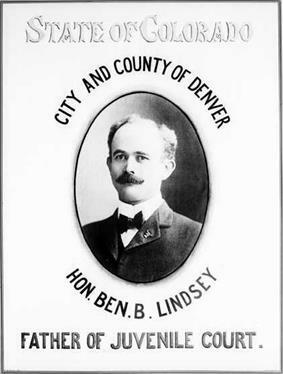 Colorado judge Ben Lindsey a pioneer in the establishment of juvenile court systems. 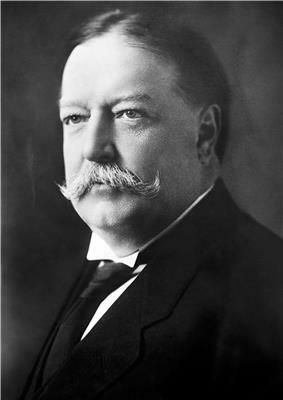 The pace was set in Detroit Michigan, where Republican mayor Hazen S. Pingree first put together the reform coalition. Many cities set up municipal reference bureaus to study the budgets and administrative structures of local governments. A coalition of middle-class reform-oriented voters, academic experts and reformers hostile to the political machines started forming in the 1890s and introduced a series of reforms in urban America, designed to reduce waste and inefficiency and corruption, by introducing scientific methods, compulsory education and administrative innovations. About 16 states began using primary elections to reduce the power of bosses and machines. The Seventeenth Amendment was ratified in 1913, requiring that all senators be elected by the people (they were formerly appointed by state legislatures). The main motivation was to reduce the power of political bosses, who controlled the Senate seats by virtue of their control of state legislatures. The result, according to political scientist Henry Jones Ford, was that the United States Senate had become a "Diet of party lords, wielding their power without scruple or restraint, in behalf of those particular interests" that put them in office. Progressives sought to enable the citizenry to rule more directly and circumvent political bosses. Thanks to the efforts of Oregon Populist Party State Representative William S. U'Ren and his Direct Legislation League, voters in Oregon overwhelmingly approved a ballot measure in 1902 that created the initiative and referendum processes for citizens to directly introduce or approve proposed laws or amendments to the state constitution, making Oregon the first state to adopt such a system. U'Ren also helped in the passage of an amendment in 1908 that gave voters power to recall elected officials, and would go on to establish, at the state level, popular election of U.S. Senators and the first presidential primary in the United States. In 1911, California governor Hiram Johnson established the Oregon System of "Initiative, Referendum, and Recall" in his state, viewing them as good influences for citizen participation against the historic influence of large corporations on state lawmakers. These Progressive reforms were soon replicated in other states, including Idaho, Washington, and Wisconsin, and today roughly half of U.S. states have initiative, referendum and recall provisions in their state constitutions.